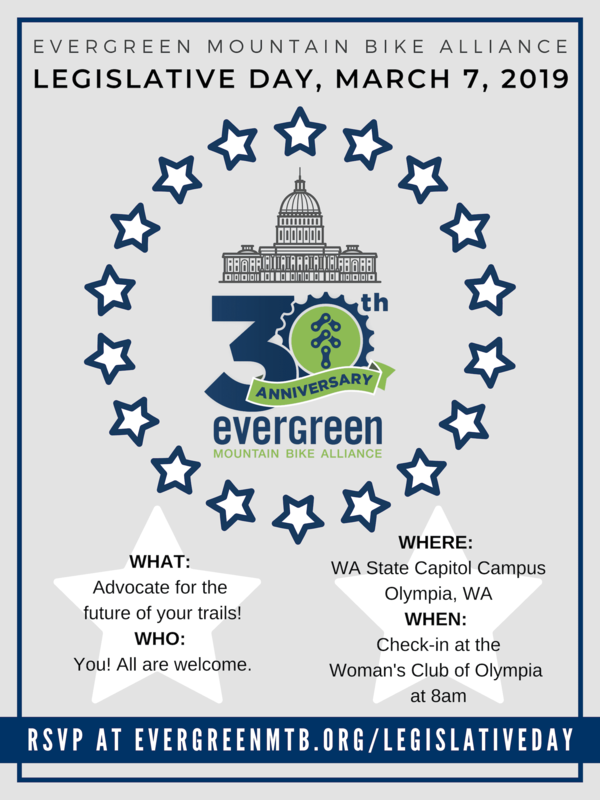 Mountain bikers from across Washington will join Evergreen staff in Olympia, on March 7th, to discuss the importance of building and maintaining trails in our state! We need you to join us in Olympia on March 7th to ensure that your mountain bike community's concerns are heard by state lawmakers! We will arrange for you to sit down with your elected lawmakers in Olympia, to talk trails and the associated community and economic benefits. No one receives the same attention from a lawmaker as a constituent does—that’s why you need to be there. The more riders we have the stronger our voice is for trails and for the economic and social benefits mountain biking brings to any community. Evergreen will coordinate your meetings, facilitate discussions, and answer any questions. The only thing we ask of you is to speak to the benefits of making Washington the best place to ride! By joining us on March 7th you will have a direct hand in making a difference for the whole state. We’ll provide issues briefings, training, and a rundown of what to expect when you meet with your lawmakers. We ask that you plan on spending most of the day so we have flexibility in scheduling, and can make the best use of your time.